Our traditional holiday feasts tend to be heavy on the meat fat, butter, spices, and sugar – after all, that’s what makes everything so delicious! However, fatty and sweetened foods are full of excess calories (which most pets don’t need), and they can be very hard on your pet’s digestive tract. Even small amounts of holiday foods can trigger a bout of pancreatitis, a dangerous and painful condition that can lead to hospitalization, diabetes, and other health problems which, in the worst case, could be fatal if not treated early on. Besides fatty foods, there are plenty of other traditional holiday treats that are toxic to pets. Among the most dangerous are chocolate and xylitol, grapes/raisins, coffee, alcohol, onions/garlic, raw bread dough, nuts, and certain spices. Don’t feed your pet table scraps or other human food, and make sure your guests do the same. Don’t allow your pet to sit under the table, get up on the table or on the counter. Clear leftovers and store away immediately after your meal. Make sure trash cans are covered securely and that trash is taken out of the house as soon as possible, to prevent your pet from scrounging. Double check that appetizer and dessert plates, and leftover cups of coffee/alcohol aren’t left out where your pet can find them. Keep all candy dishes up high and watch for any pieces or wrappers that may have dropped onto the floor. 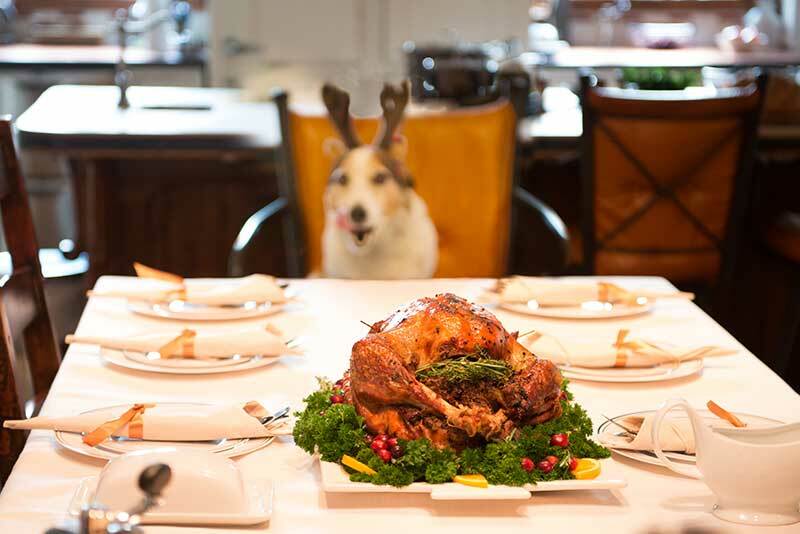 If your pet insists on begging or being under foot, have a quiet, comfortable place set aside ahead of time, where your pet can safely stay during the gathering. Just because many foods are off limits to Fido and Fluffy doesn’t mean they can’t enjoy a special holiday treat. We recommend keeping your pet’s regular treats handy to give out periodically throughout the day. Allowing your pet to have a few extra kibbles of their own food at special times is another way to satiate those “Why can’t I have the turkey and stuffing?” doggie or kitty eyes looking expectantly up at you. Although some cooked vegetables and fruits may not cause a problem for your pet, we still don’t recommend them, as any human food can cause gastrointestinal distress, even if the pet has eaten it before. Household excitement, unfamiliar visitors, unusual smells and distractions can all cause added stress and anxiety for a pet, making it even more susceptible to gastrointestinal upset. Remember, the last thing you want on a holiday is to be up all night with a pet that has vomiting or diarrhea or, even worse, to be taking your pet to the animal ER to deal with a bout of pancreatitis or a blocked intestinal tract from something that should not have been gobbled down! Although no one wants to deal with a pet emergency – and since we are closed on major holidays – should the need arise, our after-hours recorded phone message or facebook page will direct you to the pet emergency facilities we recommend. On the day after major holidays, we are open for our regular business hours. Please don’t hesitate to contact the team at Lone Tree Veterinary Medical Center for more information about holiday pet safety. Have a wonderful and safe holiday!